The Reserve Bank Governor Graeme Wheeler should consider himself pretty pleased with his initiative to reign in the property market. In my opinion it’s been a great success as a surgical tool to address one key part of the economy whilst not significantly impacting the others. The policy of enforcing a threshold by which banks could not excessively lend to borrowers with a deposit of less than 20% has not only curbed the first home buying sector but also dampened the activity of speculators and investors - the very groups that tend to inflate the market. There is no doubt that this macro-prudential tool of LVR (Loan to Value Ratio) will be eagerly assessed by other Reserve Banks around the world, particularly the Bank of England at this time as they grapple with a similar inflated property market. Around this time last year we could see from all the stats that the property market, particularly in Auckland was on a fast track towards a potential bubble. As ever the options for the Reserve Bank were limited as the tool of choice was interest rates, a rather blunt instrument which, effecting all aspects of the economy, tends to cause un-wanted consequences especially in pushing the exchange rate higher and thereby effecting export competitiveness and as a consequence, the earnings potential of the country. Examining the options, the Reserve Bank must have reflected upon the effect of the restrictions imposed by the retail banks back in 2008 at the time of the GFC to cease lending on residential property at ratios of loan-to-value in excess of 80%. This strategy was the right choice at the time in defraying the risk of property price falls onto the shoulders of borrowers, who were thereby effectively risking all their equity if they had to provide 20+% of the purchase price. 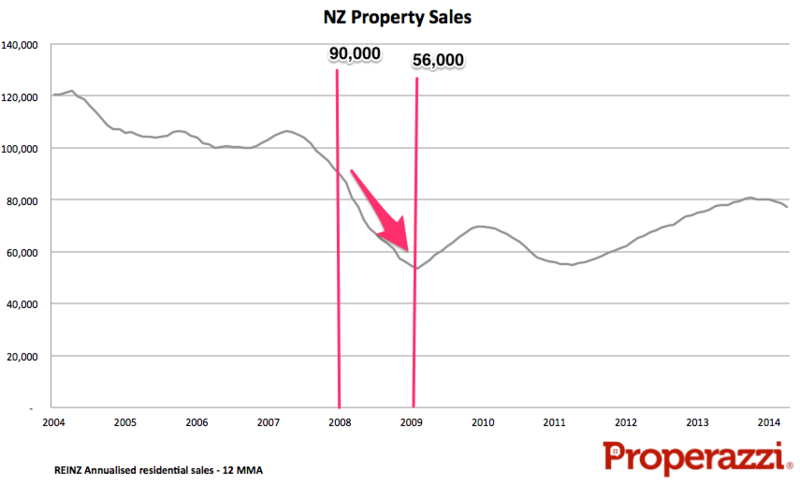 This action in 2008 lead to the significant collapse of property sales in that year, a year that started out with a 12 month total of just under 90,000 sales and ended the year at just 56,000 a fall of 38% in a year. With this test-case the Reserve Bank started to talk the proposal of LVR in the media over the winter months of last year in part to signal that the market was getting too hot and was ready to impose this LVR strategy with little notice. It was on 20th August last year that the Reserve Bank announced that from 1st October the retail banks would be restricted to 10% of their total value of mortgage lending being of mortgages with deposits of less than 20%. That announcement lead to a somewhat mild panic in the market with buyers very quickly looking to secure their position of pre-approved loans prior to the implementation deadline. This resulted in property sales in September shooting up from a 3 month average growth rate of around 8% to 19% in that month, before seeing successive months of property sales decline to date. The Reserve Bank is nothing if not prudent and conservative. The last thing they want to portray in decision making is spontaneity or knee-jerk reactions. Their message is of the classic “this may hurt now, but it better for you in the long term”. With this as a backdrop to their decision making process, it was somewhat surprising that within 2 months of the implementation of the LVR policy they were making a concession to exclude new builds from the restriction. This was in someways surprising and at the same time illuminating. To my mind this was a very clear early signal that the internal data (at that time not published) was telling them that the retail banks were being far tighter on lending restriction than the Reserve Bank had signalled. Remember, the direction that the Reserve Bank had given was that based on an initial 6 month average, retail banks were not too exceed 10% of the total value of lending to borrowers with less than 20% deposit. The data was showing at that time a level of 12% in October falling to 7% in November and what was to be just over 5% in December. To act in a manner which by their own measure was hasty was a clear indication of early success. By January the data published by the Reserve Bank had shown that the retail banks were extending new mortgages at LVR of over 80% at below 5%. So low in fact that to meet the initial 6 month average criteria the loan book for March alone could have been as high as 25% and the banks would still have been below the threshold of 10%. These numbers of course represent the aggregated total across the main retail banks, there is no indication if any one bank was more lapse or more restrictive than any other. Having seen the impact of the LVR policy, the key question for the Reserve Bank was what action was needed on interest rates and OCR. It had signalled for quite sometime that a succession of rates was to occur and delaying this was not a signal the Bank wanted to send; so the rises in March and April were pretty much baked in and implemented. However now the Reserve Bank sits here in May and have to assess what appears to be a difficult situation. The recent 0.5% increase in interest rates has kept the dollar exchange rate high which is hurting exporters and the general economy and further interest rises will only exacerbate the situation. Set against this is a fast cooling property market where the sub $400,000 sector has all but disappeared (down 32% in April vs prior year). Added to this there is no doubt that the OCR increases flowing through to mortgage rates has further weakened the property market and has pushed a large proportion of mortgage holders into fixed rate agreements. This was probably a much desired outcome by the Bank to reduce exposure of homebuyers to interest rate volatility. So I would judge (not being an economist) that the Reserve Bank now has the chance to back track on the planned further increases in the OCR at least until later in the year. It also has the ability to make some adjustment to the LVR, possibly as some have speculated to increase it to a 15% threshold. I would judge that this is a medium term solution to be implemented within the next 3 to 6 months. I would further judge that the speculation that the LVR policy could be removed before the end of the year is very unlikely, for whilst the threat of its re-implementation is always a powerful dagger to hold over the market, I sense that the Reserve Bank is not wanting to be seen to implement a innovative new policy as this still is and then to remove it, especially in an election year where political considerations weigh heavy on the media's mind. This may be a viable outlook, it may not be - I am merely providing my own interpretation, however as I stated at the beginning I would judge that the Reserve Bank governor is quietly pleased with himself and his advisors for the implementation of a policy that effectively can be used to ring-fence the property market speculative bubbles of the future without damaging the wider economy.